Gardens are usually very colorful. 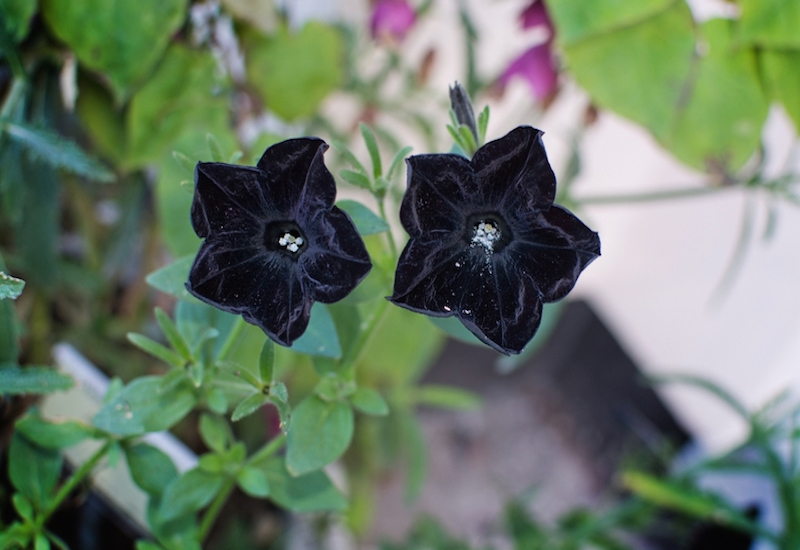 Why not add some black flowers and differentiate your garden from the rest. Here are some that you’ll love. Planting a garden is all about expressing yourself and creating a place of beauty for you and your loved ones. We like to think of the gardener as the artist, and the garden itself as the medium with which the artist creates their work. The difference here is that there is no real point of completion for this kind of artwork. Plants and flowers will keep growing, or bloom seasonally, each time creating a new and fresh look. So when we had this opportunity to create an article featuring 16 dark colored flowers, we marveled at the idea. Flowers are so often associated with brightness, happiness, and light-hearted things. But that whole bit is overdone, and to be quite honest, a little stale. We compare gardens to artwork because so many wonderful pieces of art express a darker side of our thoughts and emotions. Often times, it is this darker, more sinister art that is most impactful. So why not incorporate that darkness into your garden? Now, don’t get the wrong idea, we aren’t suggesting you go ahead and plant a garden full of only dark flowers, then walk around like there is a funeral in your backyard (although, that would be an awesome way to shock some of your neighbors). No, we think that balance is the key to creating the best garden. So find some brighter flowers that you like, and then take a look at these 16 dark flower options to balance out your space! These velvet petunias have five points formed by the petals, giving them the outline of a star. The deep black color of the flower makes it unique! The “Chocolate Soldier” Columbine is a fairly tolerant flower, and it’s chocolate or purplish petals earned it a spot in our dark flower countdown! The Arum Palaestinum flower looks just as sophisticated as is sounds. One large petal wraps around to form a delicate cone. The inside of the flower is almost pitch black! The Black Daylily is a magnificent blooming flower with a bright yellow center and petals that fan out and take on a dark purple coloring. Even the manner in which Black Gladiolus flowers grow from the stalk is different from most flowers. The petals themselves bloom in a billowing formation. You can easily guess where the Butterfly Bush got its name. Butterflies are commonly attracted to them, as well as Bees and Moths. Carolina Allspice flowers have thick petals that bloom around the center as if to shield the pistils and stamen from the outside world. The Chocolate Cosmos flower looks like something from outer-space. Large curved petals surround a cluster of tiny petals, all having a dark metallic hue. Chocolate Vines are a fantastic way to add variety to your garden. They have flowers with three large petals that open up to reveal dark purple stamen. Dahlias are large boisterous flowers with saturated colors on the petals. Bright yellow stamen can be seen in the center of the flower. Elephant Ears are great for space fillers in your garden, and look like giant black lily pads out of the water! Notice the faded green tones on certain leaves. Hellebore flowers are gorgeous when viewed from below. They have large thin petals that the sunlight can shine through, illuminating the veins within the petals. Heuchera flowers are small and delicate. They grow on long stalks with many different clusters throughout. The petals themselves are pink, but the stalks and foliage have a darker tone. Himalayan Honeysuckle is a fruit bearing flower that hangs inverted from it’s limbs. The petals are bright red, and hide the dark colored fruits growing inside. Hollyhock flowers are large and have fanciful petals. The deep blood red coloring of the flower is almost sinister. The Iris is a dignified, uniquely beautiful flower with large flowing petals. We love the black coloring and the purple stamen.